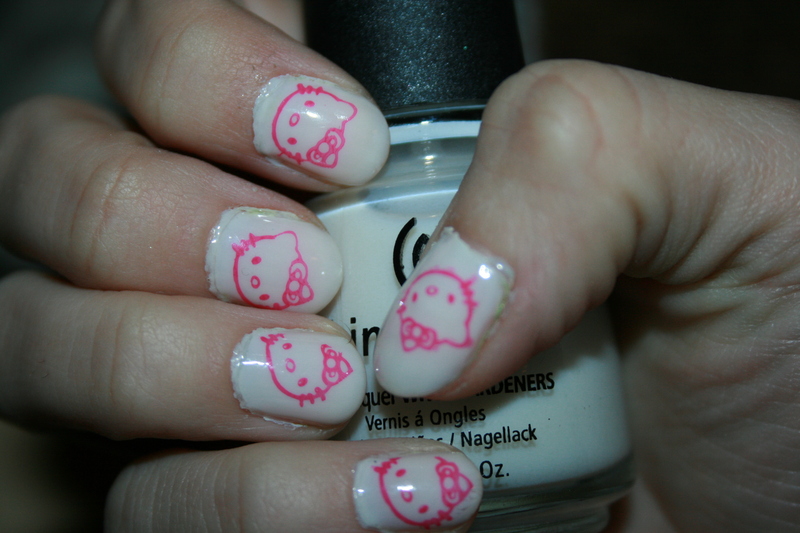 So, this kind of should be called the Hello Kitty Konadicure Fail of Awesome. It is so so messy! Like, unforgivably messy. However, I like the end result even though I’m not a fan of Hello Kitty at all really, too much bright pink for me. But a few of my friends love HK, so this is dedicated to them. The base is China Glaze Moonlight, from the Love Letters & Moonlight duo and Awakening collection. This is a milk white jelly that I’ll cover in a later post along with the 17 other polishes I bought Friday and Saturday. (Laser Lime, Borrowed & Blue, and Moonlight are 3/17) The iconic Hello Kitty stamp is from the Born Pretty M71 plate. I will be posting a review of that soon! The Hello Kittys are done in Revlon Lycra 10 Day Wear in Pink Punk. 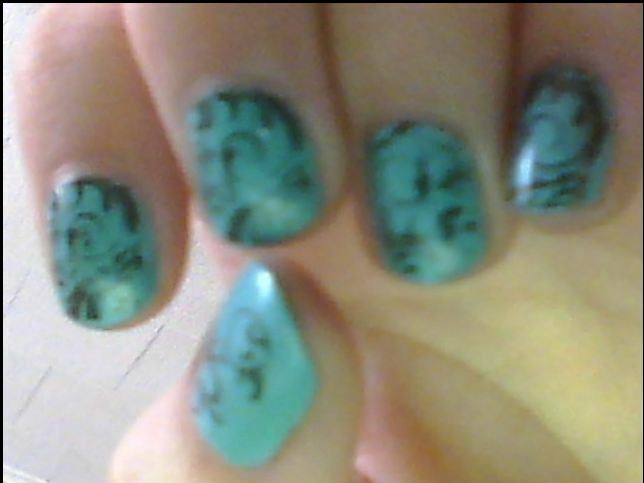 I’ve decided that every Revlon polish is amazing for Konad stamping. They’re all completely opaque on the nail even though the layer of polish is less-than-paper thin. I used Seche Base as a basecoat and Seche Vite as a topcoat. This may be the last time I use Seche Vite. I don’t need the life span provided by Seche Base or Seche Vite, and I’m sure I can find a just-as-glossy topcoat that doesn’t guarantee an asthma attack. Take A Walk On The Wild Side! 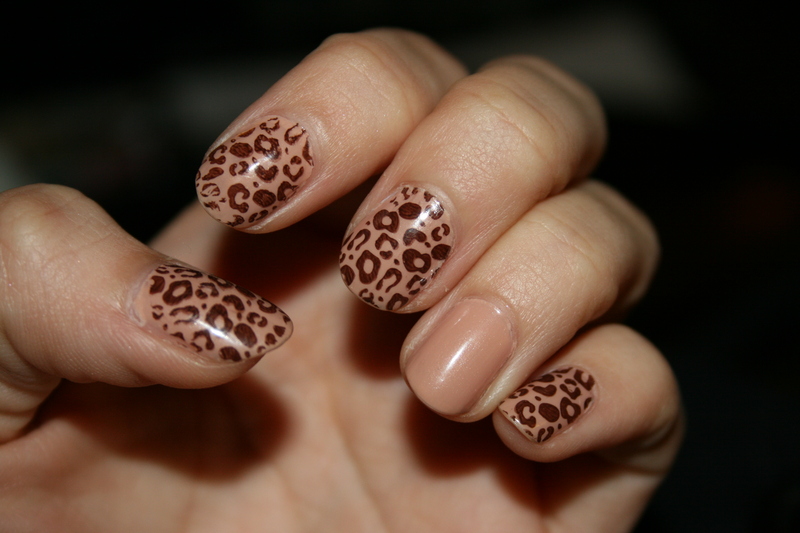 Leopard Konad print! Click picture for full detail pictures. This is a base of Sally Hansen Cafe Au Lait and Konad M57 stamp in Revlon Hot For Chocolate. YES. I am addicted to Hot For Chocolate. It’s the perfect brown! I’d never wear it alone though, it’s not my style. Excellent for Konad-ing though. Also, the wear on this is unbelievably… bad. This picture was taken after exactly 48 hours. It’s hard to tell because of the color, but there is crazy tip wear. And I didn’t type AT ALL those two days. That being said, I love this Konadicure overall. It’s neutral and demure, with a kick. LOVE IT. An old picture that I don’t think I’ve posted before. This is China Glaze For Audrey with a Bundle Monster stamp in Revlon Hot For Chocolate. Unfortunately, with the bad quality of the picture, I can’t tell if Essie Matte About You is on there or not. I don’t believe it is. After this picture was taken was when I recieved my Essie matte topcoat, and I tried it over this look.